This recap was written and submitted by the superstar ninja that is Kelly @ Belle of the Literati, who jumped into action straight away! A true sidekick. America Singer lives in Illea, the remains of what once was North America. This dystopian society has people divided up into castes designated by number. 1 being royalty all the way down to 8 who are the poorest and least educated with the worst jobs. America is a Five because her family are all artists or performers. She has been in love with Aspen Leger for the past 2 years, who is a Six. Marrying below your caste is very much frowned upon by her mother. So as a way to appease her mother and being bribed with earning her own money to keep, America enters The Selection thinking she’ll never be picked but is a way to earn money for her and Aspen’s future life together. Aspen, in the interim after she enters her name, breaks up with her because he doesn’t want her to be brought down to his status of a Six. America is picked as a contestant from her section and she goes as a way to get over Aspen and get away from all the drama and heartache. Her first night there, America has a panic attack and comes across Maxon who sits with her outside. She confesses she is only there for the money her family receives from her being in the contest, the food, and to get over a previous love. Maxon understands and they agree to be friends and she’ll help him weed out the unworthy candidates. Maxon and America become very close and he starts to have real feelings for her but respects her situation with her former boyfriend. Rebels attack the castle; there are two groups of rebel forces, the North and the South. Southern rebels are more violent and kill people. Northern rebels always give the appearance they are looking for something in the castle and are not violent. Celeste Newsome, a Two, is an itch with a capital B. Only wants the crown and tries to sabotage every girl in her way. Not cool. This is when Aspen starts to work at the castle. He’s been drafted into the military and now works to protect the grounds. America’s heart is thrown for a loop when Aspen sneaks into her room, tells her he made a huge mistake, still loves her, and they make out. Maxon and America have their first kiss!! And it makes her feel beautiful and like a real lady. FINALLY!! America continues to grapple with the insecurities and if she has what it takes to be Queen because she really is starting to like Maxon. 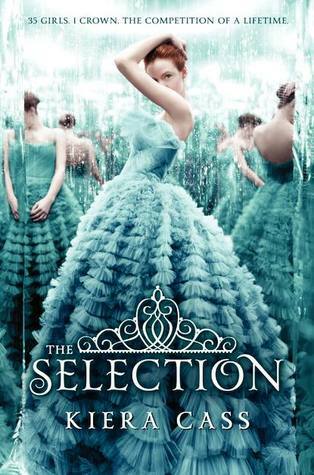 Maxon narrows down his choices to The Elite, the final 6 contestants. America, Marlee, Kriss, Elise, Celeste, and Natalie. America realizes that she wants to stay not for the money, not for the food, but for herself. She wants to give herself the chance to choose herself for once. What she wants. And what she wants is to see if there is indeed a future for her and Maxon. Yay! Illea – The country where the book takes place. 300 years in the future, it is what was once North America. New Asia – Asia but 300 years in the future. I wasn’t thinking that this book would be good until I started to read it. I ended up loving it because it had a wonderful story line that flowed very nicely and wasn’t terribly easy to predict, which is a good quality in a book. This book put a whole new twist on the bachelor idea giving it some taste and suspense. It made me feel like I couldn’t put the book down! Yet again you helped me to remember a book, thank you!